IT Academy Updates: New Site Update: The Permit Updater! “Sure thing boss,” said Pacal, with a slight cough. “Well, actually I'll have Kevin enter the scores into the Google Spreadsheet but you can put it into the other two places... Ha! Just kidding, you only need to enter the scores into one place now! And the students can see it immediately,” said A.J., triumphantly as the image of Drew at a computer crossed his mind. Hi, my name is Daniel, and as your trusty guide into the world of new site updates, I have something new and great to show you! The whole thing is pretty self explanatory and idiot proof, not implying that you are one, but we can go through how it works nonetheless. Before you can start, remeber you have to log in, either from Login link at the ITA site, or from here https://www.ita.wisc.edu/ita/status.php. Both will prompt the user for a password so, make sure you are confident when typing, the site may no let you in, sensing your nervous attitude. I'm just joking however, just don't forget your password okay? The first thing you should notice is that, when you click on the link marked Enter BTW & RT Scores, you will see that the permit score column is missing! This is because there is a separate data entry system for Permit scores and all student attempts. ITAcademy$./Permit Scores, you are in the right place! DO NOT USE SLASHES, you must use DASHES! Please take the time to read the instructions at the top. Once you have entered the score in the ATTEMPT 1 box of the same row as the particular student you can go ahead and save the score. If you find that the student has already taken the test once, you can add another attempt by clicking the SAVE SCORES AND ADD ATTEMPT button. If the column turns yellow, don't freak out, this means that you typed in an invalid input. You will be prompted to change them, so its okay. Not everyone is perfect, or have degrees in math. DO NOT DO THIS. Here is an example of a poor score entry. Even though it will allow you to do so, you must never enter a score in the second attempt slot if the first attempt slot for a particular student is blank. If you do this, you will rip a hole in the space and time continuum, causing an imbalance in the tapestry of the universe. No it actually nothing will happen, but, this is still a big deal. How can Test Peter possibly have an Atempt 2 score for a test if it is his first time taking it?! you can use the TAB key to jump horizontally from box to box. You can also triple click to highlight the contents of the entire box. Also the Copy:CTRL+C and Paste:CTRL+V combos work well when you are working with repetitive information, such as dates for an attempt. Watch out for differing dates for different attempts, as make-up tests might not line up with the whole class for each attempt. 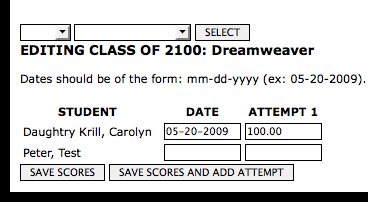 Use the scores and layout to find out what students still need to take a first or second attempt in the class! The Enter BTW & RT Scores, as great as it is, is only a temporary placement. Eventually, there will be in existence a separate data entry system for the BTW sores and the Road Test scores. Good God is this possible? Yes my friend, it is...it is. And as your trusty tour guide, I will be there to help you when that time comes! Until then, happy score entering!